First ever map of Bangladesh. A small country that lays inside India! Review by Christian 'Thor' Picard on 1/22/2013. Good map, short and sweet. 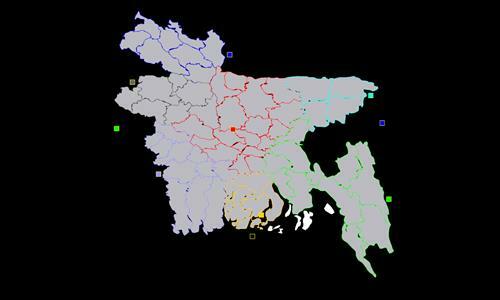 Maybe the Chittagong bonus could me be higher (or the bonus split in two bonus region instead of one) because this part of the map is clearly disadvantage from the rest of the map. There is also one missing connection between Dhaka and Gopalganj (middle of Dhaka bonus). For the everything else, good job! Review by OlGrizz on 1/23/2013. The southeast has hidden paths connecting territories, which is not fun. Review by Krulle on 1/24/2013. The East/West/Central bonuses seem a bit too much. Fun map though, thanks! Review by Mark The Destroyer on 1/11/2015. Tough map but fun to play.